When promoting their 2015 series “Black Canary,” DC comics said that avid readers had seen their violent and vocal heroine of the same name in many strange and exciting situations since her creation in 1947. However, they boldly stated that the exciting adventures for Canary were just beginning for readers, because they had “never seen her drawn by Annie Wu before.” In fact, as of 2013, competitor Marvel Comics was also just beginning to use Wu’s art to tell their stories. Despite Black Canary’s seventy year history, she has only had four solo series (story arcs where she is the title character), as well as two where she shared the title with another character. The 2015 series, which ran for twelve issues, was the first Black Canary solo series since 2007. The comic book industry has long been documented as a white, male-dominated industry, in both production and content. 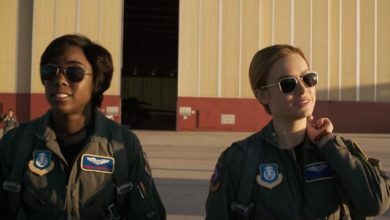 However, the last few years have seen an increase in female-led titles; in January of 2017, 26% of Marvel and 18% of DC series were fronted by women, whereas in 2010 almost none were. From these titles, a very small portion were led by women of color. Despite these small but important steps forward, there is still a drastic shortage of women involved in the creation of comic books. Whereas comics featured women in about a quarter of the releases over the last few years, in January of 2017 only about 10% of new releases for both Marvel and DC were written or drawn by women. Statistics are even more staggering for women of color: in July of 2016, author Roxane Gay became the first Black woman ever to write for Marvel comics. When there are not diverse groups of people involved in the creative process, it shows in the reinforcement and perpetuation of harmful stereotypes. In terms of art, the lack of input from women has been stark: many women are sexualized to absurd degrees, notably boasting breasts that appear to defy gravity, and curves so accentuated their backs look broken. Even with stories written by women, art that does not match the same level of sensitivity and respect for its characters can detract from the story. For example, the 2010-11 Marvel series, “Black Widow: The Name of the Rose,” written by Chinese-American author Marjorie Liu, dealt with issues of the title heroine’s bodily autonomy, trauma, and the loss of a child, providing a slow and thoughtful storytelling that the comics industry rarely approaches. However, the male artist for this series frequently depicted Black Widow in shots that flaunted her cleavage, with her jumpsuit inexplicably zipped down to her stomach. The art style was not only jarring, but was contradictory and demeaning to the themes the storyline itself presented. For these reasons, women of color like Annie Wu are crucial to the success and power of comic books. 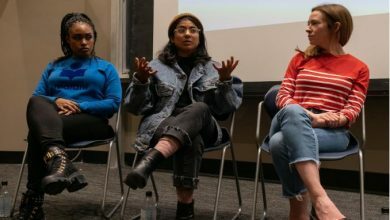 Not only will artists from different genders, races, and sexualities offer new pathways and frontiers for storytelling, they will tell them with a deeper understanding and care than could be possible for people belonging to unaffected groups. Wu’s own interests have greatly influenced her personal style. 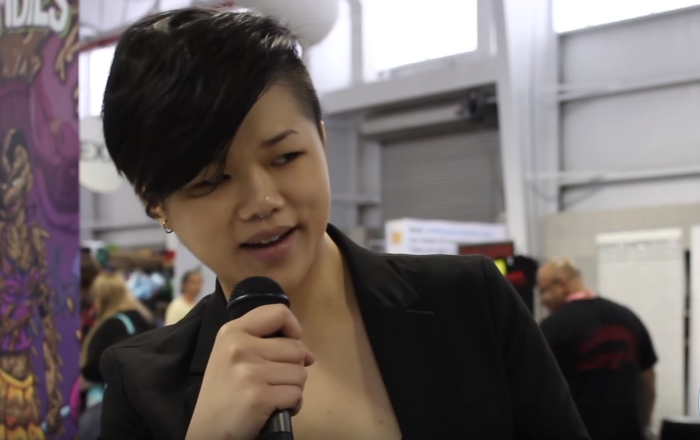 She describes herself as “a comic book artist with super hero experience who loves music, performance, fashion, mean faces and cool hair.” Wu graduated from the Maryland Institute College of Art with a Bachelor’s of Fine Arts in Illustration in 2010, not counting on or expecting a stable career in comics, though she was a long-time fan. Her art has a sketchy, aestheticized look beyond the masculine, hard-lines and strong reds of traditional comic art, making it often an unexpected surprise. After positive reception for work in series such as “Young Avengers”, she discovered that there could be a place for her style in the industry. She credits this as part of her strength as an artist; since she did not train exclusively for comics, she has a wider array of influences and experience to draw from. The majority of Wu’s involvement in the comics industry has been for female-led titles, and her depictions of women has been refreshing, to say the least. Her heroines are powerful, expressive, dynamic within the frames, and resist sexualization. They demonstrate the crucial difference between characters that are “sexual” and “sexualized” — agency. In terms of faces, many female characters are often drawn with neutral expressions so as to still remain attractive even in combat, but Wu’s drawings allow exciting, often humorous expressions that personalize and endear the characters to readers. 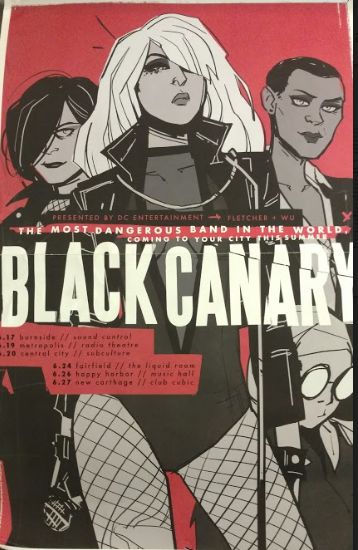 Poster featuring Annie Wu’s Black Canary. Photo taken by the author. Additionally, the characters Wu draws are often newly-created characters, or ignored long-standing ones. Therefore, she has the unique ability to define aspects of the appearance or mannerisms of these characters. In 2013, she developed a futuristic look for a new Batgirl in “Batgirl Beyond.” For the “Black Canary” series, Wu developed a new wardrobe and appearance for the character, drawing on the character’s history and her own interests. The series is lighthearted, and features the heroine attempting a break from saving the world to front a rock band, and Wu drew on this. 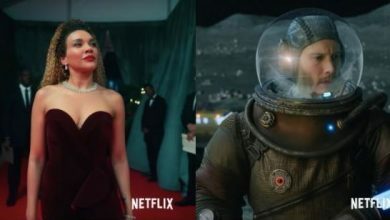 Rather than having Canary’s outfit be fixed like that of a superhero, she boasts numerous outfits throughout the series, linked together with a motif of boots, fishnets, and leather of some kind. Despite the inherently revealing nature of these outfits, the character never feels needlessly sexualized or objectified. While the character is in a vulnerable place in her life and lacking direction, the art style enforces a respect for her life and power. For Marvel Comics, Wu illustrated the third volume of the critically acclaimed “Hawkeye” series in 2014. The series starred both the original character to use the name Hawkeye, Clint Barton, as well as the new-to-the-scene Young Avenger counterpart, a woman named Kate Bishop. The volume Wu illustrated, titled “LA Woman,” features Bishop in her first solo title since her creation in 2005. The volume, brightly colored and bursting with energy, distinguishes the story – and Bishop herself – from the muted color palette and pessimism of the original Hawkeye that the previous issues portray. In this series, after nearly ten years in the Marvel universe, Wu helped to finally break Bishop free and distinguish her as her own character, unshackled to the stories of the men around her. While there is still a long way to go, the comics industry has progressed immensely in recent years, letting new characters and creators try their hand at being superheroes. This revolution of the medium is due in no small part to creators as original, passionate, and innovative as Annie Wu.